"Some Stormy Weather Here In The Northern Forest!" This week, we had some stormy weather with hot/humid conditions and now a nice cool down to finish the week. The storm that passed through on Wednesday resulted in huge volume of rain causing the lake here to reach Spring levels. The forest needed the rain as it was very dry causing concerns regarding forest fires. Along with the the storm, we had another Hydro outage the lasted for 15 hours. This was the second long outage since all the maintenance work in by Hydro in June. The first outage was 22 hours. However, the storm departed it left with an incredible Sunset as seen above. There is always beauty here in the forest if you wish to see it. The dogs are enjoying the cool down and are a little more active. Looking forward to the next season of running dogs, it is only a little over two months away. Had a nice phone visit with Doug McNeill this morning. Doug and I started mushing together about 30 years ago. It was a great visit reminiscing. 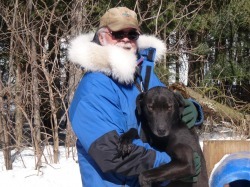 Doug was a pioneer in the mushing equipment making some of the best sleds, training carts and Dog Boxes for trucks. He was also a great musher winning an ISDRA Gold Medal in the Four Dog Class. "Return Of Heat/Humidity Here In The Northern Forest!" The heat/humidity returned here this week with worst days being Friday & Saturday. With this weather, the dogs are being fed earlier in the day due to the heat. It seems keeping the dogs on their Winter meat ration has payed off unexpectedly with helping to keep the dogs hydrated due to the extra fat in the diet. Keeping the dogs well watered also helps. The dogs seem to handle the heat better than the humans staying very relaxed and staying in the shape. They are more energetic earlier in the morning and also at dusk. It seems strange, but this is the time of year the we are thinking of the next running season and evaluating what is required. The performance of the dogs last season proved that there is no reason to look for additional canine help. The equipment is all ready. Planning is now on which young dogs will be getting more leader training. Like all sport ventures, the Offseason is planning season. "A Quiet Week In The Northern Forest!" It was a quiet week here at Miortuk. The weather was more normal for this time of year with warm days and cool nights. It was a good week for getting some chores done and spending some quality time with the dogs. Although the Stable Flies and mosquitoes were plentiful, the dogs this year (so far) have not been bothered by the either. The foliage (weeds) around the front of the chalet were cut down taking away the hiding place for these flies and mosquitoes making it much more pleasant for using the BBQ. However with the cutting, the next couple of days was crazy with the flies migrating into the chalet. After a mass extermination, the problem was solved leaving the windows a reminder of the slaughter. Now, the next job is to clean the windows to get rid of the remains. Last week and again this week, a Wild Turkey was seen close to the chalet. This is the first time I have seen one up here. "Stormy Weather And An Extreme Heat Wave, Here In The Northern Forest!" This week was a challenge due to Thunderstorms, gail force winds, extremely hot/humid temperatures and then back to Fall type temperatures. The storms caused a major Hydro outage that lasted for 22 hours causing concern for all the food (dogs & human) in the freezers would unthaw. Had to get the gas generator going to keep the food in the freezers frozen. The other major challenge this week was the heatwave that lasted for 6 days creating temperatures in the lower to mid 30's celsius with a humidex readings in the 40's. The main task this week was keeping the dogs comfortable and well hydrated. Several of the dogs dug huge/deep nests in the sand by their houses to keep cool. As you can see from the photos above, they did a good job. After the return to cooler temperatures, the houses were returned to being level. Also, the storms with torrential rain, lightning/thunder and strong winds blew in some foreign species of insects as seen above with the Fishfly that normally is seen around the lower Great Lakes and Southern Ontario. ​Needless to say the flies and the mosquitoes thrived in these conditions! On Friday the morning temperature was in the mid teens and single digits over Friday Night into Saturday Morning. The cooler temperatures was certainly welcomed by the dogs and myself!!! "Summertime And The Living Is Easy, In The Northern Forest!" The Summer has finally hit the Northern Forest with beautiful sunny days, evening storms and incredible sunsets. Of Course along with Summer is the onslaught of the Mosqitoes in the early morning and at dusk. This week ended with very hot/humid temperatures and the forecast for next week is for a continuance with temperatures ranging from the low 30's to the mid 30's Celsius with humidex readings in the 40's. Luckily it cools down in the evening and cloudy days also helps for the dogs. The dogs adjust to the heat by being much calmer and staying in the shade of their houses or the shade provided by the trees the surround the kennel. Feeding time is a little earlier in the morning and a fresh supply of water is a must. Our family of Groundhogs have relocated to another place in the forest as I beleave the mother was getting a little worried that her brood were getting to familiar with my presence. Yesterday, I saw a Wild Female Turkey very close to my chalet. This is the first turkey I have ever seen here. ​The forest here is always full of surprises.